For a period wich started in the second half of IV th Centuty B.C., in western part of Romanian and inside the Carpathian Arch, as a result of archaeological recherches, are Known elements of material culture alien to this teritories till than ( Crişan 1971, p. 154-157 ; Crişan 1977, p. 19-30 ; Németi 1986, p. 71-76; Crişan et al. 1995, p. 35-37; Ferencz , 1998, p. 215-226; Rustoiu 2000, p. 182-184; Rustoiu 2002, p. 55; Rustoiu 2005, p. 57-65). At this time, the opinions refering to this moment are not unanimous, some authors considering that the begining of that phenomenon must be placed at the beining of the third Century B. C. (Kruta 1990, p. 263) . Anyway, the archaeological situation and the events wich determinated this stated is considered of result of seating here of some Celts comunities (Crişan 1971, p. 154-157 ; Crişan 1977, p. 19-30 ; Németi 1986, p. 71-76; Crişan et al. 1995, p. 35-37; Ferencz , 1998, p. 215-226; Rustoiu 2000, p. 182-184; Rustoiu 2002, p. 55; Rustoiu 2005, p. 57-65). The historical sources wich are known today didn’t register in write the events wich we are refering at, that is whz the informations we have are not enough to recreate the historz and life of comunities established in the area we have mentioned. The contact between this population and the local oneis reflected in taking over of some material culture elements wich can be observed in archaeological discoveries. The researches look on Transilvanya during the last years have registrated progresses in knowing this period. Among other things had been shown the fact that the Celts were in this area till the first half of second Century B.C. (Ferencz, Ciută 2005). The atempt of reconstitute the modalities in wich the relations between comunities have been developed in quite difficult having only the metd we known till now. For all that, some of researches suggested hypothesis in this way, supporting the idea of mixted comunities who lived inside the settlements during the next period, trying to complete the laks of researches ( Rustoiu, Rustoiu 2000, p. 184; Popa, Simina 2004, p. 62) . In our opinion we consider that in this moment we do not have enough elements for supporting the idea that te comunities belonging to those categories of populations were lived together inside the same settements. We don’t have motives to doube the presence the celtes in the territories mentioned above, also we can’t doubt the conact between those two civilisations wich is indicated by some of material culture elements alien to Celts in other territories with an archaeological context surely belonging to the Celts. But the inhabiting withing the same settlements of those two populations can not be supported only by the presence of pottery made by hand. The presence of those two ceramic species, together inside the archaeological complexes may be interpretated as an argument for the contact betwen this two ppulations in a certain geographical area, but this asumption rises some questions to wich having these poor informations today, it is impossible to answer. Tothis situation it can be add the finding concerning the literary attestation of the name ,,dacians” only during the second Century B.C. (Caesar, BG, VI, 25, 1) , when the material culture from the territory belonging the dacians had an different aspect in comparison with that known from the period when the Celts where there. As we said, the material culture element of the populations who lived inside the area we’ve mentioned above wen the celts come it can be estabilished in actual stage of researches (Popa, Totoianu 2000, p. 76; Popa, Simina 2004, p. 66). That is why we think that the terms of ,,celto dcians” or ,,dacian/celts” as Ion Horaţiu Crişan suggested (Crişan, 1966, p. 76.) or the new formula ,,discoveries with celto-dacians or dacian-celtic character” (Popa, Totoianu 2000, p. 72; Popa, Simina 2004, p. 62) are not right and they do not reflect an historical reality. The authors above evoited to use one of those terms admiting the subyectivity of this kind of terminology (Popa, Totoianu 2000, p. 72; Popa, Simina 2004, p. 62). In the same paper they prefered to use the term of ,,celto-dacian horison” (Popa, Totoianu 2000, p. 74; Popa, Simina 2004, p. 64). The utilisation of syntagm ,,celtic-dacian” or ,,dacian-celtic material culture” can be easiar accepted, but even in this case are some problemes concerning the terminology. We are talking about the utilisation of term ,,dacian” before that appeared in the literary sources The utilisation of the word ,,dacian”, in this kind of terminology contradicts the theory according to wich ,, … the Transylvanian area entered concomitant in the sphere of interest of the Celts and Getaes populations from extra – Carpathians area at the begining to La Tène period …” ( Popa, Simina 2004, p. 66). Our oppinion consist in the fact that the difficulties in the understanding the situation are given by the actual stage of researches. We think that is very important the example given by the stage of researches from North-West of Romania, were the invstigations made during the last decades have given some answers to many questions. For the Middle Mureş area and for the whole intra – Carpathian area we think that is important the image of the nowledge level as it can be seen of the graphics present in Plate III. We also think that the following researches will establish exactly the characteristics of the relations between the populations who have lived inside the Charpathian Arch durig the first stages of the second Iron Age. Till than it is proper to use a terminology less subiective like that of material culture of La Tène Type to design objects characteristics to the Celts. 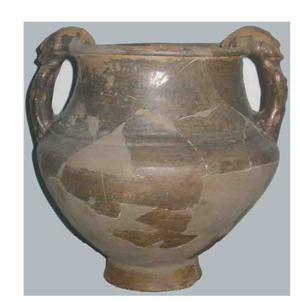 The pottery made by hand considered as being characteristic to local population may be placd in the category of materials belonging to the Second Iron Age. This term Second Iron Age is neutral and dos not implied any kind of considerations on the ethnic character of the population or the populations who spread this goods. During the last years our invstigations aimed a reduced geographical area, delimitated by the Middle Course of Mureş (Plate II) , area considered as one of the Celts penetration way in Transylvania (Nestor 1041-1942, p. 457; Rusu, Bandula 1970, p. 35). From this point of view we have tried to stabilish the main life aspects of the human comunities which lived within this territory in the earliest stages of the Second Iron Age at according to the documents we have today . The result of our investigations is not satisfactory, but at this moment we have a few elements wile offer us a base for the next investigations. Discoveries wich offer us informations on daily life of comunities are those coming from settlements. 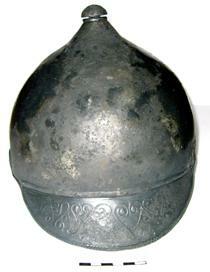 The inhabitance of populations who lived in Transylvania in earliest stages of the Second Iron Age is less known. Some monographies and papers work published during the last years gave the possibility to be known a series of elements wich give us the possibility to recreat a sketch of general elements of this problems (Popa, Simina 2004; Crişan 2000; Ferencz 1997; Popa, Totoianu 2000; Rustoiu, Rustoiu 2000; Rustoiu 2002). Concerning the emplacement of inhabitings wich are dating at this chronological horizon, Ianos Németi come up to the conclusion that, from a general point of view, the settlements are placed on the river terraces, especialy on plane and that in broken areas, on hils, the Celts penetrated the territories only along the rivers (Németi 1990, p. 54). To the same conclusion come up Aurel Rustoiu concerning theterritories situated in Northern and Western part of nowdays Romania (Rustoiu 2002, p. 50-51). Examine the relief of area we are lizing choosed of the comunities of the Second Iron Age, for the emplacement of the settlements presents clear similitudes with the situation documentated in area researched by those two researchers. Today are Known thirteen points with discoveries wich documentate the existence of this kind of sites (Plate IV). The settlements documentated till now inside the Middle Course of Mureş River area and the other discoveries are dissposed on waterside or on the rich terraces of Mureş River or of other tributarries. A different situation has registrated at Gligoreşti, were has populated a grindus formated in the area situated at the confluence of the Arieş River with Mureş River (Gogâltan et al 1996, p. 51-52; Gogâltan et al 2004, p. 66, 69, 74). All of these have a strong rural character, their emplacement in areas proper for agiculture being natural if we take into consideration that we are talking about a population formated by husbandmaen and breeders (Popescu 1960, p. 233; Crişan 1977, p. 26, 31; Németi 1990, p. 54). The ,,open” character of these settlements represents an element characteristic for the historical period we are refering to. Fortified settlements are not known in this period nither in intracarpathian area or in North-West Romania, as it has been notticed (Németi 1990, p. 54). Although in same situations it may be say that were taken some measures to stop the atacks. May be in this way it is possible to interpretate the situation of the settlement found at Gligoreşti - ,,La Holoame” (Gogâltan et al 1996, p. 51-52; Gogâltan et al 2004, p. 66, 69, 74, Pl. II). The dwellings discovered till now in the area we put into attention are deep in earth, by cottage type and semi-cottage type, and they could be framed in the typologie establish by Ioan Glodariu (Glodariu 1983, p. 10). The shape of the holes are rectangular, circular, in some cases wer found pole traces, poles wich suported the roof. A good example in this way is the dwelling disovered at Şeuşa (Ferencz, Ciută 2000, p. 24, Pl. IV ; Pl. VII), or another one of those partialresearched at Lancrăm - ,,Glod” (Popa, Totoianu 2000, p. 53, Fig. 3; Popa, Simina 2004, p. 38, Fig. 7). The pole traces were discoverd also when were researchd some dwellings contemporary to those mentioned above in adiacent areas (Popa, Simina 2004, p. 52). The plan of dwellings known tiil now in the area we aimed adopt in some cases a rectangular shape with rounding corners like that from Lancrăm (Popa, Totoianu, p. 62 ; Popa, Simina 2004, p. 52) or from Şeuşa (Ferenz, Ciută 2000, p. 24). at Gligoreşi has ben researched a pithouse habing almoust a circular shape (Aldea et al 1998, p. 22). There were little deep and one of those had th walls made by wattling stick with clay, other were made by boards or beads (Ferencz, Ferencz 2001, p. 40). The roofs wer made by reed, club rush or straws and it was elied on a wood structure and it is part of the conical group or two waves and eaves was probably till down (Ferencz, Ferencz 2001, p. 42). It can’t be excluded the posibility of the existence of some roofs having a shringle cover (Ferencz, Ferencz 2001, p. 42). The materials wich were used were those wich were easy to fiind, a comoun situation in all areas inhabited by Celts (Adouze, Buchsenschutz, p. 53). Materiile prime din categoria celor vegetale (lemn, nuiele, stuf etc.) precum şi lutul au avut ponderea cea mai mare în utilizate (Adouze, Buchsenschutz, p. 53-57). From the dates we have in this stage of researches we may say that the heating of the roos was made with the keep of some instalations made by stone and ay be with some hearths with upper rims (Ferencz, Ferencz 2001, p. 43). The iluminate was dowe may be in a natural way, through some oppenings made in roof or in walls or through the entrance area (Ferencz, Ferencz 2001, p. 43-44). Concerning the houses arrangements within the settlements, the site from Ciume ;ti offer us important dates. Inside this site the houses were builted to a relative big distance one from other (about 60-120 meters). They were grouped by two or three (Zirra 1980. p. 69), showing a certain preferences in choosing the place for houses. This kind of observations or other wich show some preocupaions for the sistematisation of inner space of some dwellings had not ben observed till now inside the site researched dated on the first stages of La Tène period, those documentated on Middle Mureş not being an exception (Ferencz, Ferencz 2001, p. 45). We think that this situation reflect the actual stage of researches, the next investigations wile give us new elemetsin this way. The materials discovered inside the settlements are representated by the pottery made by hand and by potter weel and some other made by metal, bone or glass. It is accepted that by the term of ,,necropolies” we understand the burrials in special areas, by verry known rules (Babeş 1988, p. 17). In nowdays Romania are known many necropolis and isolated graves belonging to the Celts. There are placed especially in Transylvania and in Northen parts, in Crişana or on Inferior Mureş Course. A catalogue of the sites of this kind was made bz Ion Horaţiu Crişan (Crişan 1971, p. 152, Fig. 1). 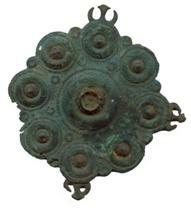 In Oltenia are known funeral complexes which inventorz contains Celtic objecs. But these are considered elements characteristics to an another cultural phenomenon, known in archaeological literature as Padea-Panaghiurski Kolonii group (Sîrbu 1993, p. 24-26). Inside Carpathian Arch, also in North-West of our countrz, the Celtic necropolis ar moustlz plane and biritual. Thez have inhumation grave and also incineration graves, with the cremation remains deposed in urns or right in the pit of the grave (Crişan 1971, p. 153; Crişan 1971a, p. 72). The biritualism characteristic to the Celtic necrpolis from Transzlvania and Eastern Hungaria is known even at the moment we the Celtic civilisation penetrated those areas, beeing mentained till their disapearence, from this aeas (Zirra 1975, p. 48 ; Nemeti 1988, p. 49-73; Nemeti 1988, p. 75-114 ; Nemeti 1992 p. 59-112 ; Nemeti 1993, p. 117-129). 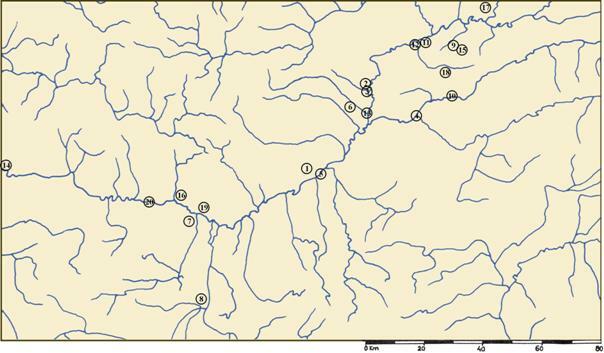 On the Middle Course of Mureş River were identified necropolis at Aiud (Crişan 1973, p. 50-51; Crişan 1974, p. 71-96) and Blandiana (Aldea 1975, p. 415-42; Aldea, Ciugudean 1985, p. 37-43), and other materials wich maz be considerated as funerar inventorz objects discovered in some localities (Plate V). The number of this kind of sites known till nowis inferior on the Middle Mueş, in comparison of those coming from settlements. Although it has to be notticed that anz of these necropolis known in our area of interest has not been researched in a sistematicl way. The existence of two necropolis at Aiud is a fact less common not being singular. This situation is at Pişcolt, Satu Mare County (Nemeti 1986, p. 77). The meaning of the fact is explained bz establish in that area and neighbourhood inhabitated bz Celts, of a new wave of Celts from those who fought in Balcanic Peninsula (Nemeti 1986, p. 76-77). In the same waz it may be explained the presence of that two necropolis at Aiud. Analizing the funerar discoveries on the Middle Course of Mureş it can be observed that the graves may be dated on Early La Tène (Ferencz 1998, p. 225 ; Rustoiu 2005, p. 64) . The presence of the Celts in the area, as the funerar complexes suggest, may be documentated till La Tène C.
Concerning the inventories, we may notticed the objects made by pottery were found moustly inside the graves. 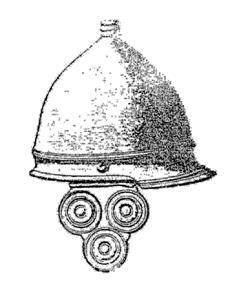 This kind of objects are: helmets (il: Hateg, Silivas, Aiud), swords, one of those being special (Aiud); special pottery vessels (Blandiana) or other kind of pieces (Aiud, bracket). The wealth, rank and position in society which some of dead persons had durring their lives are presumed by the presence of some objects plate with golden small leaf (the sword with dragon pairs and the bracket from Aiud which is not kept). Other objects made of ordinary metals or of pottery suggest the belonging to the graves inventories where were burried persons situated on a lower social scale (Pl. VI). Although are only few informations given by archaeological researches they help us to trace the most important features of the material civilization of the human communities who lived in the area situated on the Middle Mures, within La Tene B-C. Also it can be distinguished some social and religious life aspects or magical elements, some aspects of the relationshios between living persons and dead persons. To complete a part of gaps we have refrences to the discoveries from the adiacent areas. Thus the stratificated structure of communities is documentated by the diffrences between the graves inventories. As we have said before some of the gold pieces belonging the funeral inventory also indicates these diffrences, the dominating class being represented by warriors as certified the graves form Aiud, Blandiana or Silivas. It is most difficult to observe this in settlements maybe because the dwellings were not similar and the inventory were not very different. However the small number of settlements entirely or partial researched inside the Carpathian Basin represents an obstacle for the communities everyday life reconstitution. However we may say about this communities that they lived in small villages (maybe like that one from Moreşti, where were identified 6 dwellings or like that one from Ciumesti with 9 dwellings). In some cases the necropoles were placed on an dominated point like this one from Blandiana. Because of small number of researched sites we can not say if this represents a general aspect which characterize the spacial relationship between settlements and necropoles. We may say that in actual NW Romania, Ianos Nemeti observed this aspects in many situation. We believe that the fact is not accidentaly, it could reflect the habit of these populations and could also be an expresion of the respect which the living people owed and gave to dead people. It is not possible to do a comparison between funeral furniture and archaeological inventory belonging to the space destinated for the living persons because of the small number of informations we have. However, through reference to discoveries made in other areas and using in a proper way the information we have, it is possible to be realised some studies. V. Crişan, Dacii din estul Transilvaniei, Sfântu Gheorghe, 2000. Fl. Gogâltan, I. Al. Aldea, A. Ursuţiu, Raport preliminar asupra investigaţiilor arheologice de la Gligoreşti - ,,La Holoame”, com Luna, jud. Cluj (1994-1996), în Apulum XLI, 2004, p. 66, 69, 74, Pl. II. Vl. Zirra, Locuiri din a doua epocă a fierului în nord-vestul României, în StCom Satu Mare, 4, 1980, 39-84. Pl. I. 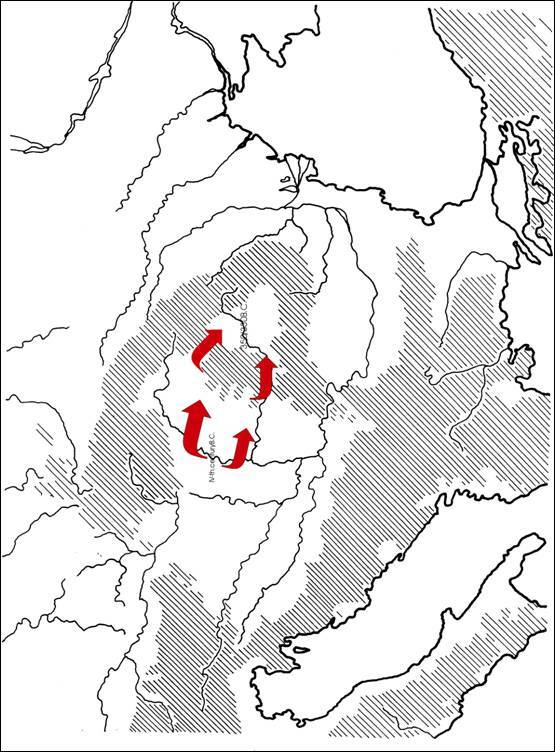 The stages of Historical Celts migrations towards East. Pl. II. Discoveries dated on Early and Middle La Tène from the area of Middle course of Mureş River. 1. Acmariu; 2. Aiud; 3. Alba Iulia; 4. Blaj; 5. Blandiana; 6. Câlnic, 7. Craiva; 8. Cut; 9. Deva; 10. Gârbova; 11Gligoreşti; 12. Haţeg; 13. Heria; 14. Ighiu; 15. Jidvei; 16. Lancrăm; 17. Luncani; 18. Lunca Târnavei; 19. Micoşlaca; 20. Noşlac; 21. Oarda de Jos; 22. Ocna Mureş; 23. Ohaba Ponor; 24. Peţelca; 25. Săvârşin; 26. Sebeş; 27. Silivaş; 28. Şeuşa; 29. Şoimuş-Bălata; 30. Şona; 31. Şpălnaca; 32. Turdaş (Alba); 33. Turdaş (Hunedoara); 34. Uioara de Jos; 35. Uroi; 36. Veţel; 37. Vinţu de Jos; 38. Zlatna. Pl. III. The actual stage of knowing Early and Middle La Tène on Middle course of Mureş River. Pl. IV. 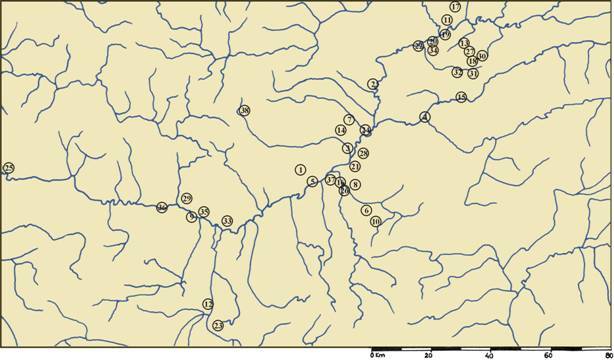 Settlements dated on La Tène B and C, on Middle course of Mureş River: 1. Aiud - ,,Microraion III”, 2. Aiud - ,,Sub Pădure”, 3. Gligoreşti - ,,La Holoame”, 4. Lancrăm - ,, Glod”, 5. Micoşlaca, 6. Noşlac, 7. Oarda - ,,Cutină”, 8. Ocna Mureş, 9. Sebeş - ,,Podul Pripocului”, 10. Şeuşa - ,,La Cărarea Morii”, 11. Uioara de Jos, 12. Vinţu de Jos - ,,În râpa terasei dinspre Sibişeni”, 13. Vinţu de Jos - ,,Lunca Fermei”. 19. Uroi, (oraş Simeria) jud. Hunedoara20. Veţel, com Veţel, jud. Hunedoara. l. VI. 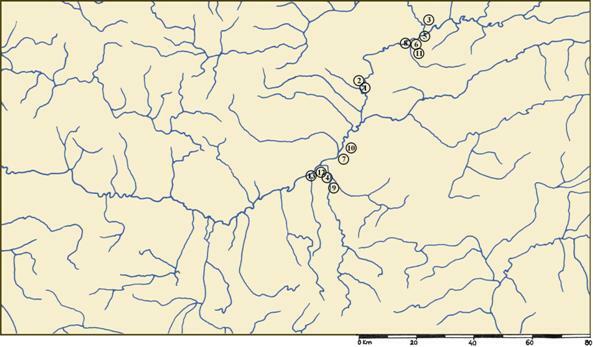 Some representatives archaeological materials discovered in funerar complexes situated on Middle course of Mureş River.